In January 1972, Aretha Franklin, already a multi-Grammy, #1 hits pop superstar, decided, with her next album, she would go back to her roots. She joined forces with longtime friend/mentor/producer, Reverend James Cleveland, and the Southern California Community Choir on the gospel album “Amazing Grace”. The songs were recorded, over two nights, at the New Temple Baptist Church in Watts, CA. Sydney Pollack, fresh off a Best Director Oscar nomination for “They Shoot Horses, Don’t They?”, was selected to film the sessions, which were done in front of a live audience at the church. Warner Bros. first intended to air the footage as a television special, but then decided a movie was a better idea. The studio actually planned to make the film part of a double-bill in theaters with “Super Fly” (as incredible as that sounds). However, the young Pollack made a rookie mistake: he failed to use clapboards prior to any of the recordings so the audio tracks and film could be synched-up properly in editing. Therefore it was impossible to match the footage, and the project had to be abandoned. The “Amazing Grace” album was released, as scheduled, in June ’72. It was an instant hit, eventually selling more than 2-million copies and is considered one of the greatest Gospel albums of all-time. Now, more than 46 years later, the movie of those historic sessions has been released. But it wasn’t without even more struggles. The silent footage remained in cans for decades, until Pollack (shortly before his 2008 death) passed them on to producer Alan Elliott. His dream was to finally complete the Aretha concert doc project. Painstakingly, over the next few years, using modern, digital methods, Elliott was able to synch-up the music and film. And the results, both visually and musically, are spectacular. “Amazing Grace” is a stunning and transcendent experience. But why is the movie only coming-out now, years after the project was completed? That’s because Aretha Franklin actually sued Elliott twice, once in 2011 and again in 2015, to prevent the film from being released without her permission, which she refused to give. Sadly, it took Franklin’s death last year for the film to be given its life. Days after The Queen Of Soul passed last August, Elliott went to the Franklin family and got the green light to finally unveil “Amazing Grace” to the public. That amazing backstory is worthy of its own documentary. As for “Amazing Grace”, needless to say, it was worth the wait. 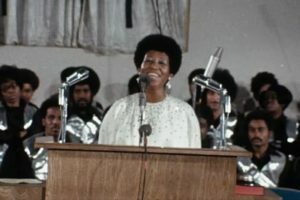 The 29-year-old Franklin glows (in glorious white on the first night and green paisley on the second) as she performs transcendent gospel classics. The five 16mm cameras capture her tenacity (sweat pours down her face), along with the emotions of Cleveland, and the choir (led by director Alexander Hamilton). And the audience becomes the 4th character in the film, with members freely singing, dancing, yelling and even fainting while witnessing the power of Aretha’s voice and message. Her rendition of “Amazing Grace” on the first night (the first half of the film) is gut-wrenching and astounding. On Night Two, her father, Reverend C.L. Franklin, and gospel icon Clara Ward are in attendance. When Franklin performs “Never Grow Old”, with her adoring dad only a few feet away, is emotionally haunting. “Rolling Stones” bandmates Mick Jagger and Charlie Watts, who snuck into the session on that second night, are shown simply in awe. Because of what it is, “Amazing Grace” doesn’t provide the kind of depth we see in the today’s documentaries, which focus on entertainers. There’s only brief rehearsal footage and no narration or insights into Aretha, except from the stories told by Cleveland and Reverend Franklin (which are enjoyable). But as a cinematic concert experience, it’s authentic, joyous, special and truly one-of-a-kind. Add on the “story behind the story” (including watching Pollack and his crew scrambling around the auditorium, completely unaware that what they are shooting will be deemed worthless and gather dust for decades) and it’s safe to say that we’ve never seen anything like this before. Aretha may no longer with us, but “Amazing Grace” is her triumphant encore. On The Official LCJ Report Card, “Amazing Grace” gets an A-.